Upgrading Pivot sprinklers is a prime way to boost efficiency. Sprinkler technology has evolved significantly over the last few decades, so if older model sprinklers are being used, efficiency might be increased by updating the package. 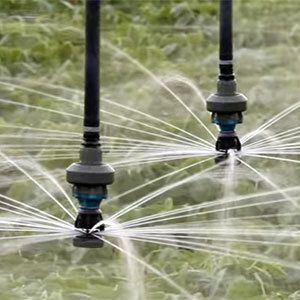 Further, brass sprinklers can wear when used to distribute sandy water, so updating these sprinklers can boost efficiency and improve uniformity as well. There are tons and tons of old, worn out sprinkler packages out there that aren’t efficient, so that is one of the first things a grower should look at. There are a number of ways to determine if Pivot sprinklers might need changing. Infrared photos provided by both satellite and airplane services, while expensive, can dramatically reveal irrigation inadequacies and non-uniform patterns on a farm. If an increase in fuel or energy costs related to pumping water is detected, the sprinkler package might be worn out. On an electric setup sometimes it’s enough to use an amp meter and see how many amps the pump is drawing. As a sprinkler package wears, nozzle size is going to get larger and the flow rate goes up. As a result, the pump has to work harder and, thus, the amp draw increases. Another low-cost check is using a numbered drill set to check the size of the sprinklers’ nozzle openings. If a drill bit larger than the nozzle’s original design size can fit into the nozzle, obviously there is significant wear taking place. The biggest advantage for farmers comes from switching from older-model sprinklers to modern, low-pressure versions for an overall water and energy savings. Selecting new Pivot sprinklers is an important process, that includes many factors like soil type, type of terrain, available pressure and the type of crop to be grown. Ensure the height above the ground of sprinklers in relationship to the spacing along the pipeline is adequate to provide proper coverage and uniformity. With heavier-type soils, make sure the sprinkler selected provides the proper throw distance to minimize runoff. Calculate how much it will cost to apply water at proposed operating pressure and based on yearly operating hours. If using LEPA-type sprinkler devices, make sure the spacing of the devices is close enough.